BEST, a middle and high school robotics competition whose mission is to engage and excite students about engineering, science, and technology as well as inspire them to pursue careers in these fields. Through participation in our project-based STEM program, students learn to analyze and solve problems utilizing the Engineering Design Process, which helps them develop technological literacy skills. It is these skills that industry seeks in its workforce. 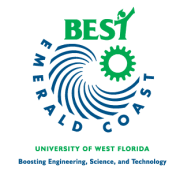 Emerald Coast BEST Robotics is a hub of BEST Robotics, Inc located at the University of West Florida and provides a free robotics curriculum to all participating middle and high schools. Our core objectives are to provide students with a real-world engineering experience that incorporates the practical application of math and science. Prepare students to be technologically literate and thus better prepares to enter the workforce. Help students develop leadership, project management, teamwork, and organizational skills. Develop students' confidence and competence through self-directed learning, decision-making, abstract thinking and problem-solving. Would you recommend Emerald Coast BEST Robotics?